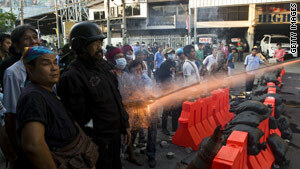 Protests in downtown Bangkok have turned violent, eroding business confidence in Thailand. (CNN) -- The economy of Thailand -- whose growth this year so far has belied its political ails -- is now seeing more of a direct impact as protests grow increasingly violent. Thai Finance Minister Korn Chatikavanij told CNN the protests have taken between 0.3 percent and 0.5 percent off the nation's gross domestic product so far this year and have had an "incalculable impact on investor confidence." The protests could shave as much 2 percent of GDP if it continues through the rest of the year. "The longer it lasts, the greater the risk of violence breaking out -- which has proven to be the case," said Korn. "Once violence breaks out, the potential impact on the economy is all the more greater." One person died from clashes Friday and two were in critical condition, a local hospital director said. All three were shot. A rebel red shirt leader who was shot Thursday while being interviewed by Western journalists was also in critical condition. On Friday afternoon, government troops were tightening around a protester encampment as shots rang out around the area. The typically bustling downtown area of Bangkok has shuttered its businesses as Red Shirt protesters occupied a 3-kilometer wide area near the business district. The 1,700 shops and 10 hotels in the area are losing an estimated $6 million a day. One in six of Thailand's 61 million citizens live in the Bangkok area. Tourism, which makes up about 6 percent of the Thai economy and employs more than one million people, has been hardest hit by the protests that began in March. Banyan Tree Holdings, which owns several resorts in Thailand, projects that bookings and residential sales will take a hit this year. "Unless there is a resolution to the Thai political situation soon, there is no clear visibility on the Group's performance for the rest of the year," Chairman Ho KownPing said Thursday in a statement. "Clearly the impact on the economy has been the impact on tourism," Korn said. "Obviously pictures that are appearing on TV screens across the world has obviously spooked potential tourists. Several governments have issued travel warnings for Thailand as a whole and we've seen bookings disappear at least for the months of June and July." The government still predicts the Thai economy will grow at least 4.5 percent this year. The World Bank had earlier predicted that Thailand -- the second largest economy in Southeast Asia -- will grow 7 percent this year. Foreign investors had been bullish on the Thai economy. But in recent weeks, the investment tide has turned. Overseas investors shed $130 million in the month of April, according to the Thai Stock Exchange. That sell-off has escalated in the past week as foreign investors sold off $584 million in Thai shares the past six sessions, Reuters reported. Korn said there was little disruption to business outside the immediate vicinity of the protests. "Those who invested in Thailand generally invested in areas outside of Bangkok, and they have been in no way undermined by the ongoing protests ... so from that perspective it's been pretty much business as usual," Korn said. "That's why the economy has kept humming along for that reason," Korn said. "But the protests definitely have an impact on confidence and will definitely have an impact on the decision-making process for investors."